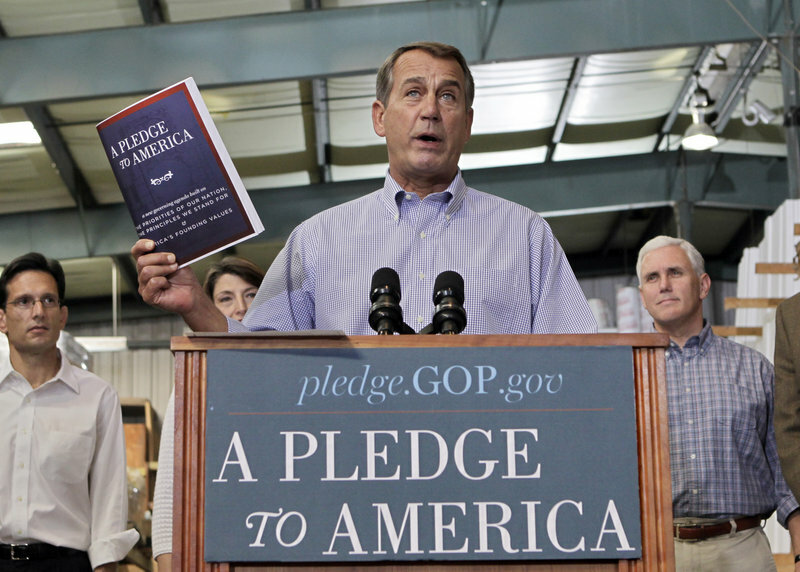 Their 'Pledge to America' could appeal to tea partiers and independents as midterm elections loom. STERLING, Va. – Pushing toward big gains on Nov. 2, House Republicans promised to end a slew of Democratic policies and restore Americans’ trust in government as they rolled out a campaign manifesto designed to show they’re listening to an angry public and are focused on creating jobs. At a hardware store in suburban Washington, senior House Republicans in shirtsleeves showed off the 21-page document they say would guide them should they gain a majority of seats in the midterm balloting five weeks away. The “Pledge to America” was filled with familiar proposals to slash taxes and spending and cut down on government regulation, as well as repeal President Obama’s health care law and end his stimulus program. In a show of unity, Senate Republicans and Haley Barbour, chairman of the Republican Governors Association, issued strong statements of support. The unveiling capped a private debate among Republicans that had pitted those who favored making an agenda public against others who argued it would merely open the party’s candidates to criticism in a campaign that has been tilting their way. Republicans have sought to turn the midterm elections into a referendum on the policies of President Obama and the Democratic-controlled Congress. Democrats, in turn, want it to become a choice between two alternatives — what they describe as their own efforts to fix the economy, as opposed to what they criticize as Bush-era policies that led to a severe recession. For their part, Democrats dismissed the GOP plan as recycled ideas that would further exacerbate the nation’s problems. “Republicans want to return to the same failed economic policies that hurt millions of Americans and threatened our economy,” said Nadeam Elshami, a spokesman for House Speaker Nancy Pelosi, D-Calif.
With polls showing voters disenchanted with Obama, worried about the economy and mad at elected officials, the agenda also vows to change the way Congress works — requiring every bill to cite its constitutional authority, for example, and to be made public for three days before a vote. Their new agenda is rife with the kind of grassroots rhetoric that could appeal both to tea party activists and to independent voters the GOP is courting in its quest for control. Polls show large majorities are fed up with Congress and both parties and show Republicans have a chance to earn the public’s trust on key issues.